In the email account set up section of cPanel, you are allowed to set a quota for each email account. But because the system allows you to enter any quota for an email account, from 0MB to Unlimited, there is a chance that users are assigned a quota that exceeds the entire hosting account, or have already used up a huge chunk of the allowed storage size. If your email account(s) is at 100% of the disk usage capacity, it will no longer have space for any new incoming emails – these emails may be bounced. This is true on both the account- and domain-level. For example, you are on the Unlimited Hosting plan. Now say you created 3 email accounts and you have assigned a “Unlimited” disk quota for each of these accounts. The Unlimited Hosting plan comes with domain email storage allowance of 10GB. If one of your email accounts has hit the 10GB storage mark, not only will new messages to that email account be bounced, new messages to all email accounts under the same domain name will also be affected. Of course, the easiest way to free up mail server disk space is to use an email client and download all your emails onto your local computer (ie. using POP3), but if you prefer webmail or IMAP, then emails will still remain on your mail server, taking up precious disk space. That is why we strongly recommend that you manage your email accounts disk usage regularly to avoid running into unnecessary problems or email disruption. 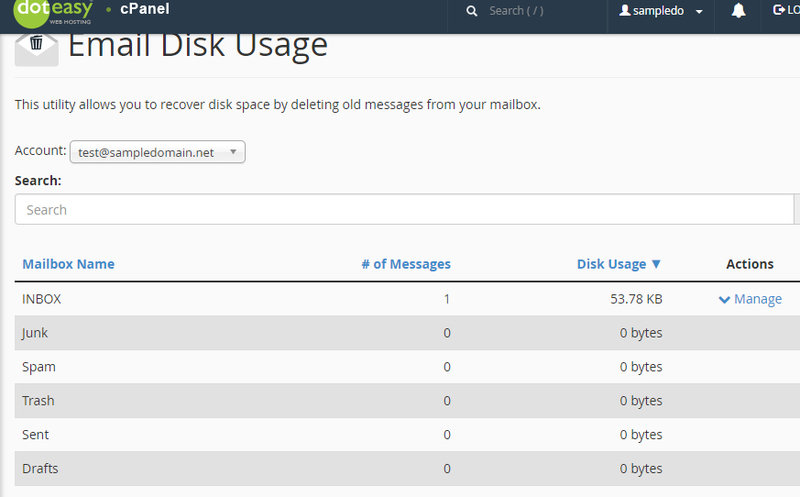 On your account cPanel interface, you will find the Email Disk Usage feature. This feature allows you to view all of your mailboxes and quickly remove old emails or large messages. Actions – click Manage to remove message from the folder. Now, using the cPanel’s Email Disk Usage feature, you can easily delete unwanted emails from your email accounts.